The 1955 Cadillac Series 62 Convertible was a beautiful, behemoth of a boulevard cruiser that enjoyed quite a reputation for not only great looks and elegant luxury, but was no slouch in the performance category for such a large, heavy (weighing in at approx. 5,000 lbs.) vehicle. 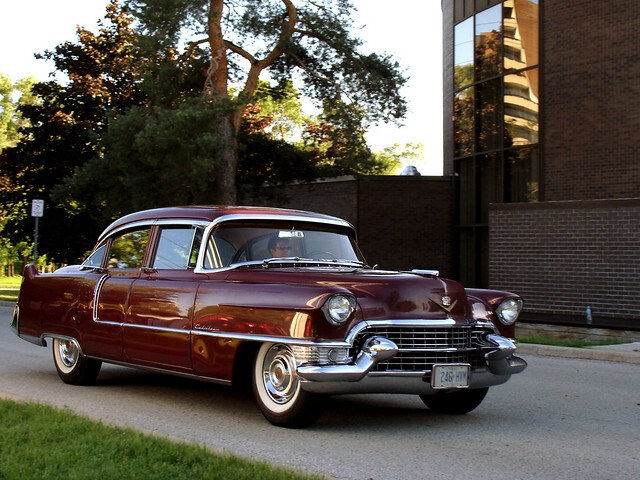 This was the fourth generation, 1954 to 1956, in the long run of the Series 62 models from Cadillac (fourth out of seven total generations of the Series 62, beginning in 1940 and running through 1964). This was a lower, more streamlined version of the third generation Cadillac Series 62 models and came with many refinements and updates. Cadillac was at the top of its game, globally, in the luxury car segment and you knew you had "arrived" if you were "well-heeled" enough to be the proud owner of one of these babies! "Eldorado" style, curved or "wrap around" windshield. Touches of the famed automotive designer, Mr. Harley Earl, were evident throughout the vehicle including the larger rear tail light "fins". The gas filler was still located (or hidden) behind a door, just below the left rear tail light. The rear bumper was updated and the large, vertical ends housed a port for each of the dual exhaust pipes to exit.